Everything you need to get competitive. 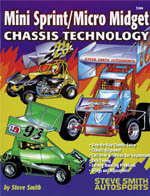 For all 125, 250 and 600 micros, and 1000 to 1200 minisprints. Full of photos and drawings. SPECIAL PACKAGE: Buy the V194 video and S286 book together for only $62.95.